Patio covers are an ideal outdoor living product and can be a great addition to your home in Crestview, Florida. A patio cover provides a shaded space where you can escape from the direct sunlight, and is perfect over patio furniture, a barbeque, and more. 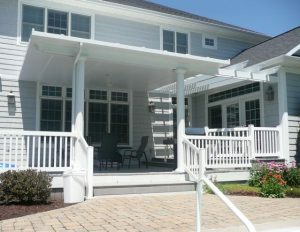 Since 1997, Majors Home Improvement has been the company that area homeowners rely on for patio covers, and we would be pleased to boost the look and function of your backyard with one of these durable structures. Individualized service – We provide Red Carpet service for our customers to ensure they have the best possible home improvement experience with us. You’ll be kept in constant communication throughout the entire process and we’ll work hard to answer all of your questions and provide an efficient installation. A built-to-last product – We install patio covers from TEMO, one of the foremost patio product manufacturers in the industry. A TEMO patio cover is constructed from durable extruded aluminum that can withstand virtually all of nature’s elements. A professional installation – Our highly trained installers will carry out a precise installation to ensure your new patio cover stands strong throughout the decades. They will be respectful of your home and leave a pristine backyard when they are finished. If you’d like to learn more about the patio covers we install for homeowners in Crestview, FL, and all surrounding areas, contact Majors Home Improvement today.